Local residents have seen yellow lights moving this way and that in the skies, and making noises. MEXICO CITY (04.Aug.2017) - The 3,180 kilometer distance that constitutes the border between Mexico and the United States has become a hot spot for sightings of UFOs having a variety of sizes, shapes and colors. 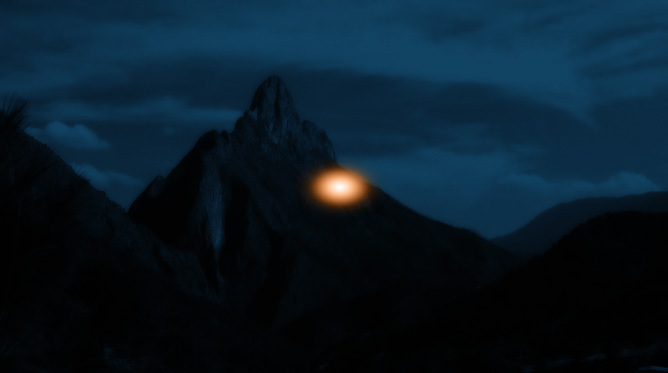 The communication media has taken the matter with considerable seriousness, whether it is in Tijuana and Mexicali in Baja California, Ciudad Juarez, Chihuahua; Monterrey, Nuevo León, as well as the cities of Saltillo and Monclova in Coahuila - cities where sightings of strange flying objects are constant. A few days ago, strange yellow-hued lights were seen over the municipality of Ramos Arizpe in Coahuila. According to witnesses they moved this way and that in the skies, and even emitted noises. Journalistic sources state that these strange lights headed from one mountain range to another at moderate altitude. "On occasion, the lights traveled at low speed. But later, while noises could be heard, the objects were not readily apparent. In other instances they are indeed visible and the noises they make are also audible to animals." What all locals wonder is whether these noises come from inside the Earth or if they are generated by the transit of these lights - a phenomenon that has occurred for the first time, at least in Mexico. Ivan Escamilla, the host of the Adimensional television program, stated: "The community is startled. These are cases that have been taking place for some months now. We carry out skywatches to obtain images, but we have no photographs or videos for the time being. All we have are stories. It is a small town, quite distant from the city, but we'll be there," declared the renowned researcher cuttingly.